“Earth is probably still the world’s most common building material. The word cob comes from an old English root meaning a lump or rounded mass. 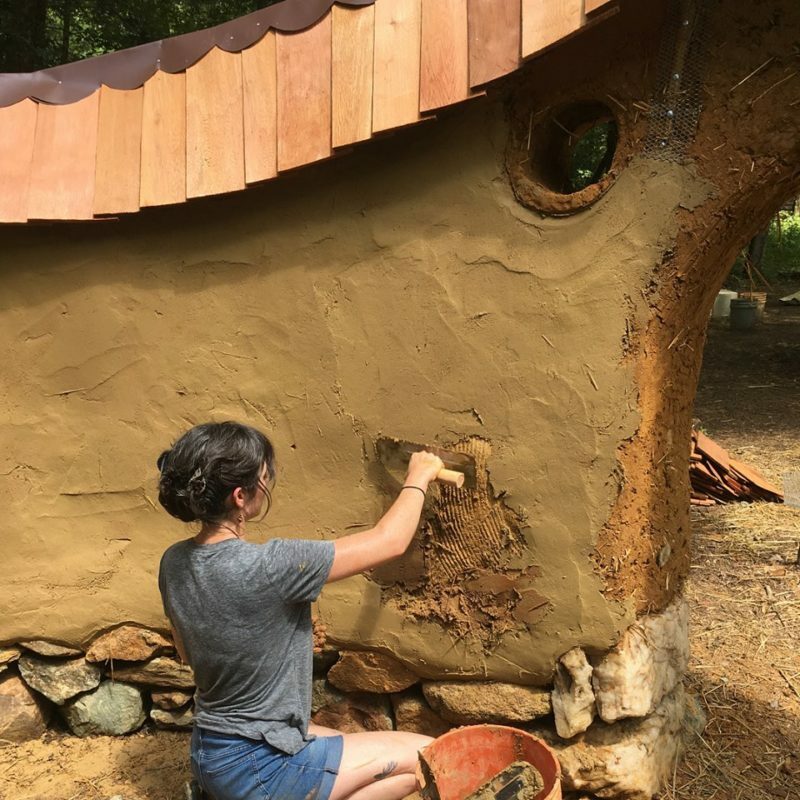 Cob building uses hands and feet to form lumps of earth mixed with sand and straw, a sensory and aesthetic experience similar to sculpting with clay. 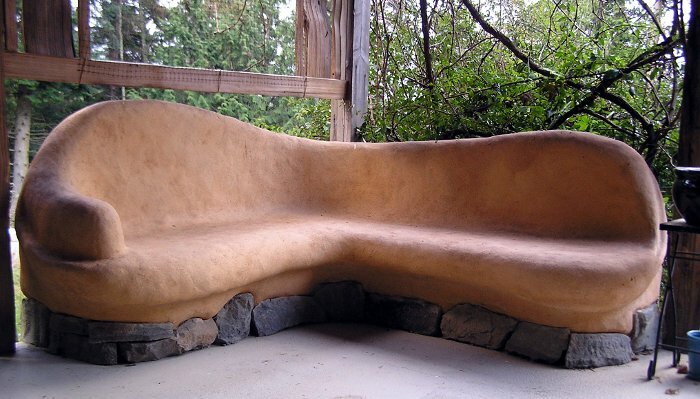 Cob is easy to learn and inexpensive to build. Because there are no forms, ramming, cement or rectilinear bricks, cob lends itself to organic shapes: curved walls, arches and niches. Earth homes are cool in summer, warm in winter. Cob’s resistance to rain and cold makes it ideally suited to cold climates like the Pacific Northwest, and to desert conditions. The small Salvadoran village of Río Chiquito is located about 2 hours north of San Salvador in the cloud forests of “El Trifinio” Biosphere on the slopes of El Salvador´s highest mountain “El Pital”. The community is home to around 200 hard working farm families whose vegetable production and peach orchards blend in well with the natural cedar and hardwood forest and the abundant springs of fresh water. Located at 2,100 meters, (7,500 feet), the workshop will be held on a small, organic farm implementing agroecology and permaculture practices. There are several cob buildings located on the farm as well. Despite a deeply rooted peasant identity amongst the local population, migration to the United States (mostly by young men) in recent years has begun to bring much outside influence into Río Chiquito. One such aspect is related to housing as many families have given up traditional adobe homes to build “modern” and supposedly superior cement cinder block houses with money sent back from migrants in the US. 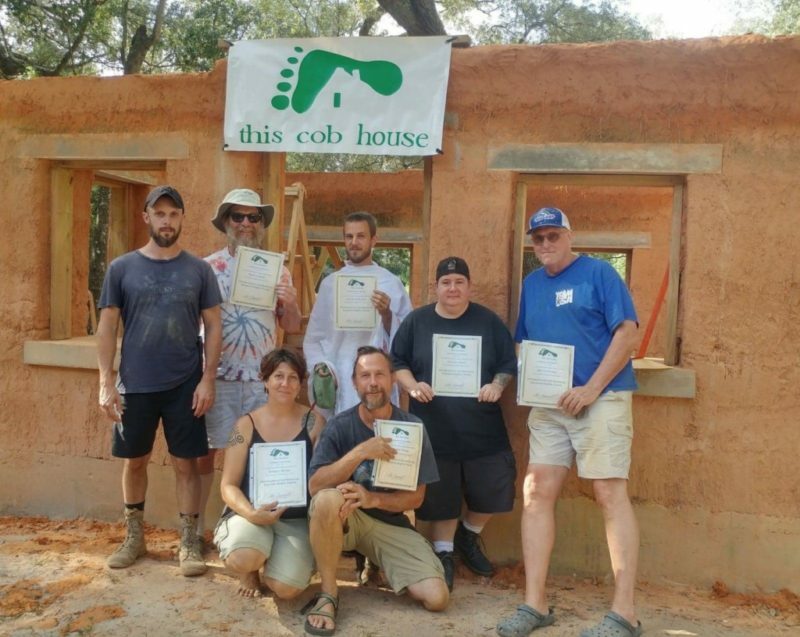 The “complete cob workshop” is designed to teach natural building techniques to folks from “the outside” who are interested in discovering how to live more sustainably through learning how to build their own homes from natural and locally sourced materials. It is also an opportunity to introduce building with cob to young people in Rio Chiquito as a complement to traditional adobe homes and as a way to stimulate pride in vernacular architecture. Additionally, a group of 7 families from the area are in the process of starting up a community eco-tourism cooperative and are currently building a series of cob cabins to rent out to tourists. During the workshop we will be working on three different cob structures that will be part of the community eco-tourism project that are in different phases of construction. The workshop hopes to draw a maximum of 15 participants. The families involved in the community eco-tourism project will also be involved in the construction. The workshop will be led by Tobias Roberts and Yasmin Méndez. 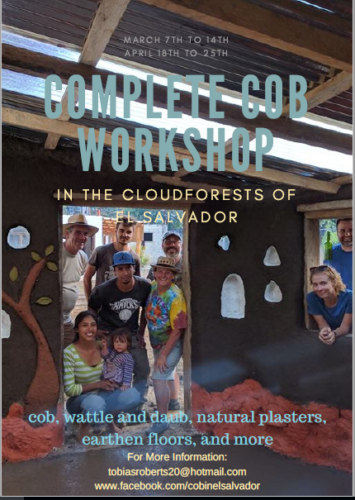 Tobias participated in a cob workshop led by Diane Jennings of Disputanta Cob in 2011 and has since built 7 different cob houses while working with different non-profit organizations in Guatemala together with Yasmin. They have also built a 1,100-square foot cob home for their family. Apart from running their permaculture farm, they also run a natural building consulting/contracting business. You can see some of their cob construction work at www.facebook.com/cobinguatemala and www.facebook.com/cobinelsalvador. El Salvador has gained international notoriety as a country reeling with violence from youth gangs and drug trafficking. However, the vast majority of this violence is confined to the urban areas of the country. The quiet village of Rio Chiquito where the workshop will be held is a quiet, peaceful town where violence of any type is a rarity. Workshop participants will be picked up directly from the airport and driven (by van) to Rio Chiquito. Furthermore, workshop participants will be given the choice between camping near the construction site, staying with local families, or staying in a local hotel. April 22nd Creative/Artistic opportunities for sculpting, creating niches and other means to enliven your cob structure. April 25th Return to San Salvador Airport. Flights leavings no earlier than 11 AM. Those that wish to stay after the workshop to travel around El Salvador or Central America, we are willing to drop you off anywhere between Rio Chiquito and San Salvador. Any expenses for optional tourist travel are your own and you would be responsible for getting back to the airport by yourself. We will begin each day with breakfast a 7:00 AM and begin work around 8:00 AM. We will break for lunch around noon and finish working around 4:00 PM each day of the workshop. There will also be opportunities to travel to local tourist attractions such as hiking the El Pital mountain. The price of the complete cob workshop covers three meals a day, fresh water available all day long, lodging in local hotels, with local families, or camping sites, transportation from the airport in San Salvador to Rio Chiquito and vice versa by van, and all construction costs for the cob workshop including all tools to be used. Workshop participants will also receive an electronic copy of the book “Building with Cob: A step by step guide” by Adam Weisman and Katy Bryce and the cob classic “The Hand Sculpted House” by Ianto Evans. Furthermore, workshop participants will have the priceless opportunity to experience the wonderful hospitality of the Salvadoran people. Due to the cost of round trip airfare that workshop participants must cover themselves, we have aimed to make this course as reasonably priced as possible. The cost of the course covers only the necessary expenses related to food, lodging and construction costs.